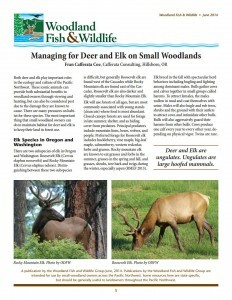 Both deer and elk play important roles in the ecology and culture of the Pacific Northwest. These iconic animals can provide both substantial benefits to woodland owners through viewing and hunting, but can also be considered pest due to the damage they are known to cause. There are many pressures on habitat for these species. The most important thing that small woodland owners can do to maintain habitat for deer and elk is to keep their land in forest use.